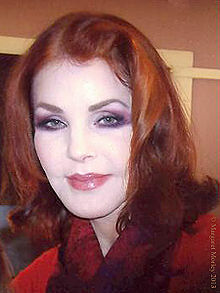 Priscilla Presley (née Wagner; born is an American actress. She is the former wife of Elvis Presley and is the mother of Lisa Marie Presley. Presley is probably most famous for her roles in the television primetime soap opera Dallas, and The Naked Gun movies with Leslie Nielson. She is also a member of Scientology. Presley was born in Brooklyn, New York City. Her maternal grandfather, Albert Henry Iversen (1899–1971), emigrated from Egersund in Norway to the United States in 1905. He married Lorraine Davis (1903–1984), who was of Scots-Irish and English ancestry. They had three children: Albert, Jr. (March 1922), James Richard (March 1924) and Anna Lillian Iversen (March 1926). Anna was later called, or her name was changed to, Ann. She was called Rooney (short for Annie Rooney) as a child. At the age of 19, she gave birth to Priscilla. They both still have cousins in Norway. In a letter to the City Hall of Egersund, Ann asked for information about their relatives, and wrote that Priscilla was interested in knowing about them; Priscilla's parents then visited family members in Norway in 1992. She attended General H.H. Arnold High in Wiesbaden, West Germany. This page was last changed on 3 July 2018, at 05:48.